Obesity is becoming a major health concern in horses (and people) all around the world, and is increasingly recognised as an equine welfare issue because it compromises both health and performance, but can you recognise if your horse is too fat or, for that matter, too thin? 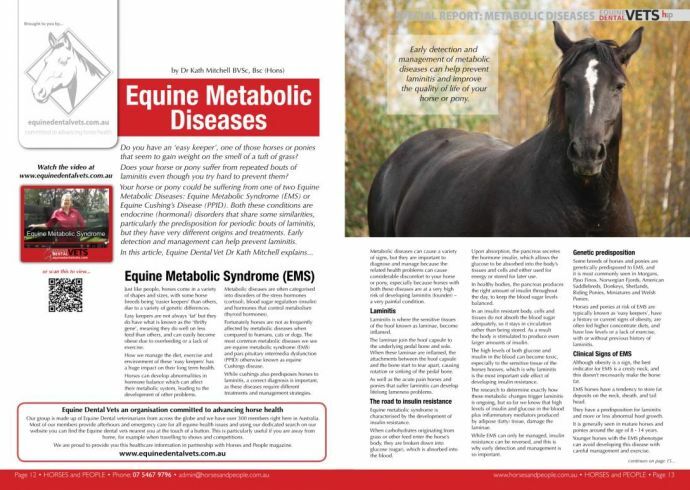 In this article, Dr Jennifer Stewart, an equine veterinarian and researcher who specialises in equine nutrition, discusses in detail the importance of keeping horses in a healthy condition, how the body condition scoring system is used to assess the state of each animal, and the steps you can take to successfully control the weight of your horse or pony. How many times in your life have you suffered from the common cold or flu? Colds and Flu involve infection and inflammation of your sinuses, the hollow areas of the head connected to your nasal cavity. Snotty noses and all those other symptoms that make you feel miserable, are fairly common in horses. Without a thorough investigation, diagnosis and treatment of the underlying cause, sinus disease can become chronic, and will severely limit the horse's health and performance. 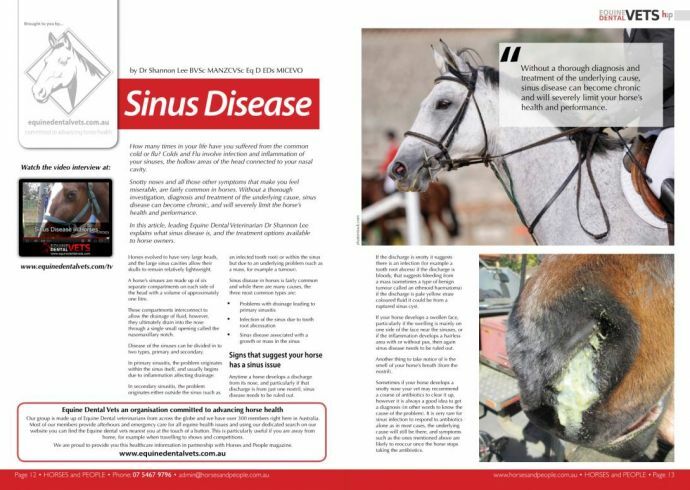 In this article, leading Equine Dental Veterinarian Dr Shannon Lee explains what sinus disease is, and the treatment options available to horse owners. Hindsight is a wonderful thing, and buying horses is a risky business. While there is no such thing as a perfect horse, a pre-purchase exam (PPE) can answer many questions about the likely significance of an abnormality and likely long term prognosis to protect you, the purchaser, from buying a problem that may be expensive, risky or even impossible to fix or treat. So what does a PPE entail? 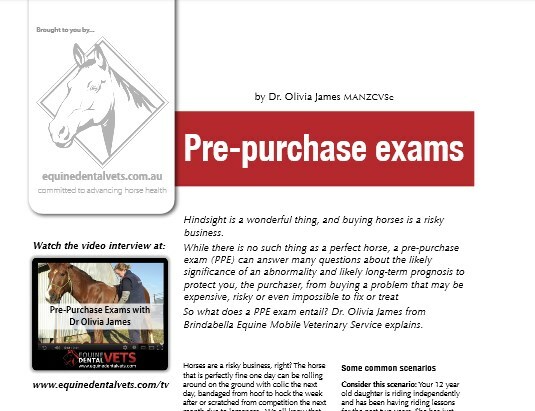 Dr Olivia James from Brindabella Equine Mobile Veterinary Service explains in this article, and don't miss her video in our TV section. Sometimes as part of caring for your horse, your vet may recommend sedation or anaesthesia to allow another procedure to be performed safely. 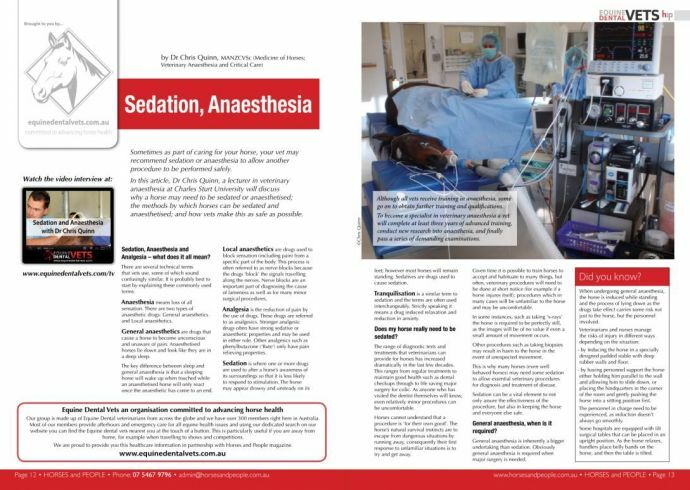 In this article, Dr Chris Quinn, a lecturer in veterinary anaesthesia at Charles Sturt University will discuss why a horse may need to be sedated or anaesthetised; the methods by which horses can be sedated and anaesthetised; and how vets make this as safe as possible. 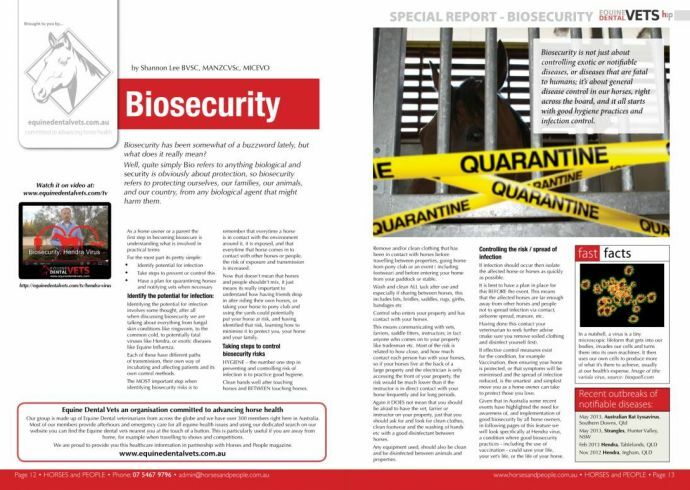 Biosecurity is not just about controlling exotic or notifiable diseases, or diseases that are fatal to humans; it’s about general disease control in our horses, right across the board, and it all starts with good hygiene practices and infection control. Dr Shannon Lee discussed biosecurity, what you can do about it, and how important it is to both horse and humans. 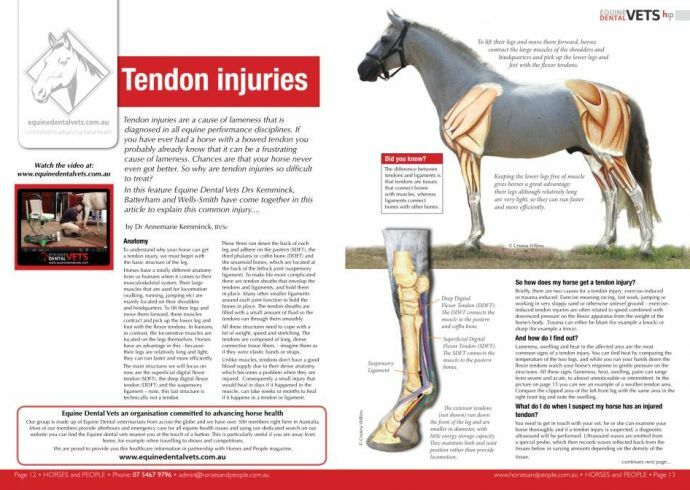 Tendon injuries are a cause of lameness that is diagnosed in all equine performance disciplines. If you have ever had a horse with a bowed tendon you probably already know that it can be a frustrating cause of lameness. Chances are that your horse never even got better. So why are tendon injuries so difficult to treat? In this feature, published in Horses and People March 2013, Equine Dental Vet Members Drs Kemmink, Batterham and Wells-Smith have come together in this article to explain this common injury. Skin diseases of horses in southern Australia. As with all species, skin disease in horses is common. Whereas sometimes symptomatic treatment of the clinical signs results in a successful outcome, many cases are more complex and so good treatment outcomes rely on an accurate diagnosis and a multifactorial treatment and or management approach. 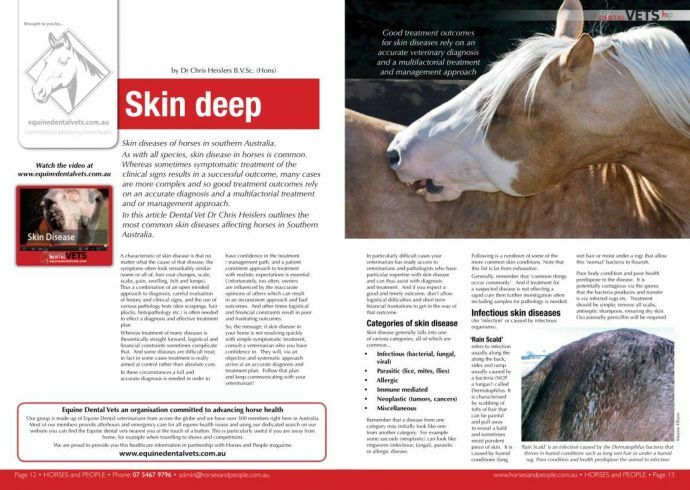 In this article Dental Vet Dr Chris Heislers outlines the most common skin diseases affecting horses in Southern Australia. 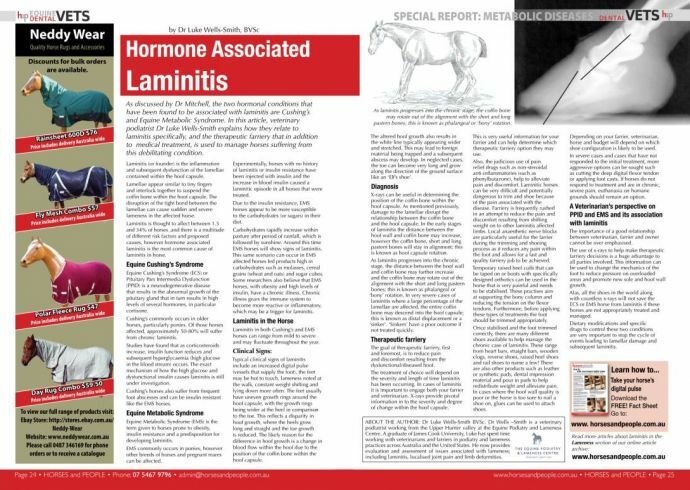 As discussed by Dr Mitchell, the two hormonal conditions that have been found to be associated with laminitis are Cushing’s and Equine Metabolic Syndrome. In this article, veterinary podiatrist Dr Luke Wells-Smith explains how they relate to laminitis specifically, and the therapeutic farriery that in addition to medical treatment, is used to manage horses suffering from this debilitating condition. 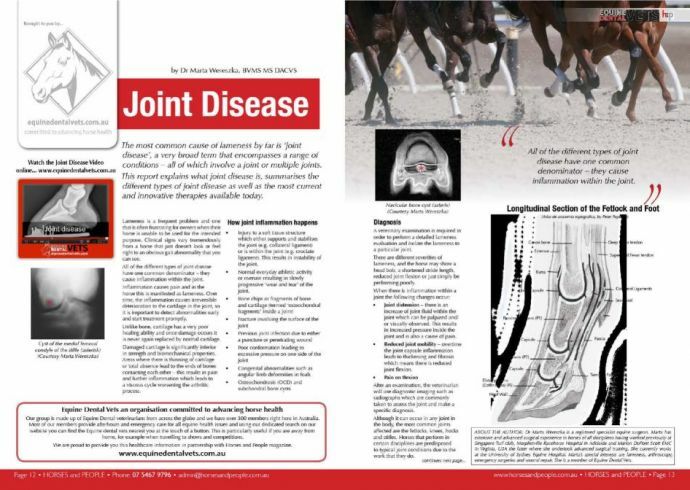 The most common cause of lameness by far is 'joint disease', a very broad term that encompasses a range of conditions — all of which involve a joint or multiple joints. This report explains what joint disease is, summarises the different types of joint disease as well as the most current and innovative therapies available today.